While we don’t like to think about such sad matters, very young children can drown in less than 2in (6cm) of water. Ponds have become very popular in the last few years, they provide biodiversity, reflections, movement, and sound in our gardens. However if you have young children this may not be the best thing to have outside your home. A grille or rigid mesh can be used to secure a pond, however for very young children it should be noted that this must be fitted above the highest water point in order to prevent a water hazard. Check regularly for signs of deterioration. The mesh should be heavy duty (i.e. 6-8mm diameter wire) which will make it self-supporting. Thinner wire mesh will require supporting with a frame. Over a large pond, a frame may be required to provide stability and anchor points. The frame should clear the maximum height that the water level could reach and take into consideration any sagging that might occur. If this is the case the methods used to secure and lock the frame in place should not allow a child to get trapped in any moving parts. Do not remove the cover until the children are old enough to recognise and understand danger. If you want to be absolutely sure that your pond doesn’t present a water hazard, then you should fill it. Make sure to remove or thoroughly break up any liner. This allows water to drain away, otherwise you could end up with a bog garden which might be just as dangerous. Then you can fill your hole with soil to make a flower bed or more lawn. If it is a small pond it might make a nice sandpit. Some people fit their trampolines into a hole to avoid having such a large structure in the garden, and this might be a better use of an old pond for your family. Care will have to be taken that very young children can’t get trapped or use the trampoline unsupervised. 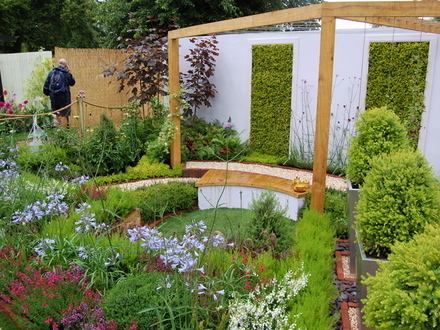 Another use for a big hole left by a pond is to have a sunken seating area, which can make a great sheltered spot in a windy or overlooked garden. See the example above from the Hmpton Court Flower Show. Fencing off the pond is a partial solution to the dangers of water in the garden. Do not allow yourself to fall into a false sense of security. Fences will need to be panelled, or have vertical railings with bars no more than 100mm apart. They should be at least 1.1m in height to follow the Building Regulations safety principles. If you have a gate it must be a similar design to the fence and be locked shut. You could consider using a swimming pool gate, which have been designed with extended latch mechanisms to be out of children’s reach.